Light, it is a key to the way we function day-to-day. It affects our mood, it tells us when to wake and when to go to bed, it is an external clock that automatically triggers our minds. It defines an ambience, it highlights, makes plants grow and can create an atmosphere of warmth. Lighting says a lot, it can make guests feel welcome and heighten a romantic interlude. It sets the stage for entertainment and has the ability to direct your attention. It provides security and a sense of piece and calm. People may fear the dark, but no one fears the light. You'll be amazed at how a skylight or roof window can bring your house to life by flooding previously dark spaces with natural light. Introducing more natural light into your home from one or more skylights will make your rooms feel more spacious, expansive and more beautiful. 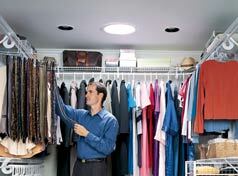 The increase in natural light can help decrease your overall energy costs. 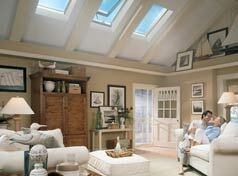 Skylights that open up can also provide ventilation in rooms that may not be well ventilated. 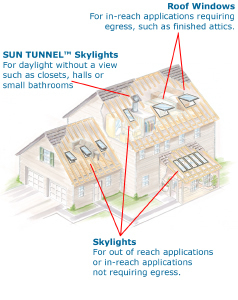 You'll be asking yourself why you didn't install skylights years ago. Proper installation, of even the most energy-efficient skylights, is critical to ensure that its energy performance is achieved. Unless you are a senior level do-it-yourself individual it's best to have a professional install your skylight to avoid water leakage, heat and cooling loss. Always follow the manufacturer's guidelines when installing a skylight, it may sound like common sense, but the manufacturer really does know the proper way for their product to be installed. Consideration must also be given to the slope of the skylight and potential moisture problems. Solar heat gain is affected by the slope or angle of the skylight. If you want high solar heat in the winter and low solar heat in the summer than a high slope is the proper installation angle. Some manufacturer's provide bases that are are tilted in order to increase the angle of the skylight. 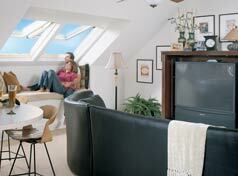 The most common installation problem with skylights is water ingress. If you follow some basic rules it will help to prevent water leaks and ingress. Use a curb, which is a watertight structure that is raised above the roof surface, and allows you to mount the skylight at an elevation above the roof surface. All joints, in the curb, where the curb meets the surface of the roof and where the skylight meets the curb should be sealed. Always follow the manufacturer's guidelines and do not take shortcuts. If you are in an area where winter freezing occurs it is prudent to install a layer of waterproofing material over the flanges and flashing in order to prevent damage caused by ice damns.